© Tsuburaya Productions Co., Ltd. Source: Tsuburaya Productions Co., Ltd. The following list presents English and Japanese titles for live action and animated movies, television programs and home videos produced and/or released by Tsuburaya Productions (円谷プロダクション, Tsuburaya Purodakushon). Rather than relying on any of the many unofficial fan translations, this list features the official English titles created and used by Tsuburaya Pro, their business partners and licensees. Information has been culled from multiple sources, including materials from Tsuburaya’s International Sales & Promotion Department, US copyright registrations, sales catalogs and publicity materials, screenings at film festivals and trade shows, and film organizations such as UniJapan. This list is by no means complete and will be updated as new information becomes available. Corrections and additions are appreciated; please contact SciFi Japan at scifijapan@gmail.com. ULTRAMAN. © Tsuburaya Productions Co., Ltd.
FIGHT! MIGHTY JACK. © Tsuburaya Productions Co., Ltd. EMERGENCY 10-4, 10-10. © Tsuburaya Productions Co., Ltd.
ARMY OF THE APES. © Tsuburaya Productions Co., Ltd. THE BERMUDA DEPTHS. © 1978 Rankin/Bass Productions, Inc.
ULTRAMAN 80. © Tsuburaya Productions Co., Ltd.
ANIME CHAN. © 1984 Tsuburaya Productions Co.
ULTRA Q THE MOVIE. © 1990 Tsuburaya-Eizo Co.
Co., Ltd./ Toei Co., Ltd.
ULTRAMAN TIGA. 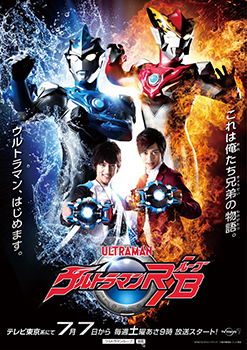 © Tsuburaya Productions Co., Ltd.
Ultraman Gaia Movie Production Consortium. ULTRAMAN NEOS. © Tsuburaya Productions Co., Ltd.
ULTRAMAN GINGA. Image courtesy of Tsuburaya Pro.